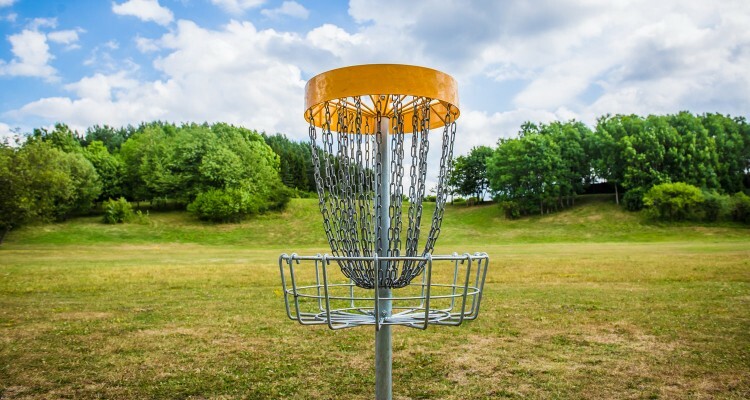 The most obviously unique part of a disc golf course is the target. In the early days of disc golf, trees, light poles, and trash cans were designated as targets. The DISCatcher® PRO28 represents the state of the art in disc golf target technology. We’ve upgraded the baskets and tops to catch better than ever. With 28 chains and a 14 spoke basket, they are the gold standard. The Innova DISCatcher® PRO28 is the best catching and most visible disc golf target. The DISCatcher® PRO28 is a favorite of parks departments and course professionals — in 2012 over 200 new courses were installed using DISCatcher® PRO28 targets. The bright yellow band improves visibility from the tee and also distinguishes the disc golf course to other park visitors. Our yellow powder coated target top makes the Innova DISCatcher® PRO28 highly visible. All stainless steel construction makes it long-lasting and low maintenance. Hot-dip galvanized basket, pipe and chains allow our targets to weather the elements for years. Our target tops are made entirely from stainless steel. 14 outer chains grab your disc, while 14 more inner chains buffer and slow the disc. This makes the DISCatcher® a favorite target of players. Don’t pay extra! DISCatcher® PRO permanent target prices include locking collars and installation tubes. DISCatcher® PRO permanent and portable models have received Championship certification by the PDGA. It is ideal for all levels of tournament play. Is your course in need of a blast of new color? Does your school want a disc golf course that matches the team’s colors? Maybe you want multiple pin placements on your course all the time. You now have the power to customize! Our custom target colors are only limited by your imagination. Please contact Innova for more information and pricing. If you have multiple course layouts, you’ll need additional pin placements. Install a tube for each target location and you can easily switch positions to alter your course. Multiple pin placements give players variety and reduce wear from foot traffic around the target.